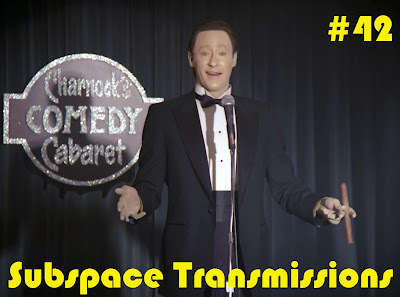 Subspace Transmissions: A Star Trek Podcast: EPISODE 42 - "WHEN STAR TREK DOES COMEDY"
EPISODE 42 - "WHEN STAR TREK DOES COMEDY"
As a franchise, Star Trek does many things brilliantly, but is comedy one of them? This week hosts Cam Smith and Tyler Orton, along with special guest Nick Eagland, celebrate the most hilarious moments to ever grace the screen, from tribbles to Mirror Universe hijinx, and everything in between. In addition to the varied assortment of chuckles, guffaws and chortles, the trio also strive to determine whether Worf or Data is the superior TNG comic relief, which series is the funniest and exactly why the writers often inspired groans (helloooo Insurrection!") while grasping for laughs. Plus, just because we appreciate your listenership, Tyler fan-casts the Ferengi heroes of "The Magnificent Ferengi" as Avengers. And that's no joke! Wanna appear on the show? Shoot us a 30 to 60-second audio clip letting us know what your favorite STAR TREK COMEDY moments are and you could take the spotlight in an upcoming program! You can also send any other questions, topic ideas or feedback to subspacetransmissionspod@gmail.com! EPISODE 43 - "PERILS OF THE TRANSPORTER"
EPISODE 41 - "SPACE MADNESS!" EPISODE 40 - "STARS ON TREK"